Skinner founded his career in "asset protection" on fear. To touch anyone under his protection was to invite destruction. A savagely effective methodology, until Skinner's CIA handlers began to fear him as much as his enemies did and banished him to the hinterlands of the intelligence community. Now, an ornate and evolving cyber-terrorist attack is about to end that long exile. His asset is Jae, a roboticist with a gift for seeing the underlying systems violently shaping a new era of global guerrilla warfare. At the root of it all is a young boy, the innocent seed of a plot grown in the slums of Mumbai. Brought to flower, that plot will tip the balance of world power in a perilous new direction. 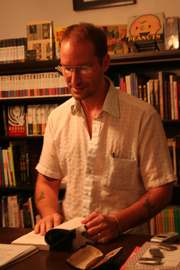 Charlie Huston is the author of the bestsellers The Mystic Arts of Erasing All Signs of Death and The Shotgun Rule, as well as the Henry Thompson trilogy, the Joe Pitt casebooks, and several titles for Marvel Comics. He lives with his family in Los Angeles. Thank you for supporting MysteryPeople, Charlie Huston and your local independent bookstore! Charlie Huston signs My Dead Body. Charlie Huston's book The Mystic Arts of Erasing All Signs of Death was available from LibraryThing Early Reviewers. Charlie Huston is currently considered a "single author." If one or more works are by a distinct, homonymous authors, go ahead and split the author. Charlie Huston is composed of 3 names. You can examine and separate out names.